Sea Ghost 110 is a sit-on-top fishing kayak. At 11’, it provides great maneuverability. It comes with comfortable two-position Hero seat, so you can fish for hours without having to worry about your back. With its three storage compartments and good weight capacity at 425 lbs provides great storage capacity. Moreover, with its multiple mounting points and track system, you can attach all your necessary fishing accessories. Its built-in rudder helps in tracking and its design really is something to admire. Its four handles provide easy transportation. With its feature-rich built and an affordable price point, it really provides value for the money. We have used it for four months now and our fondness for it has really skyrocketed over this time. 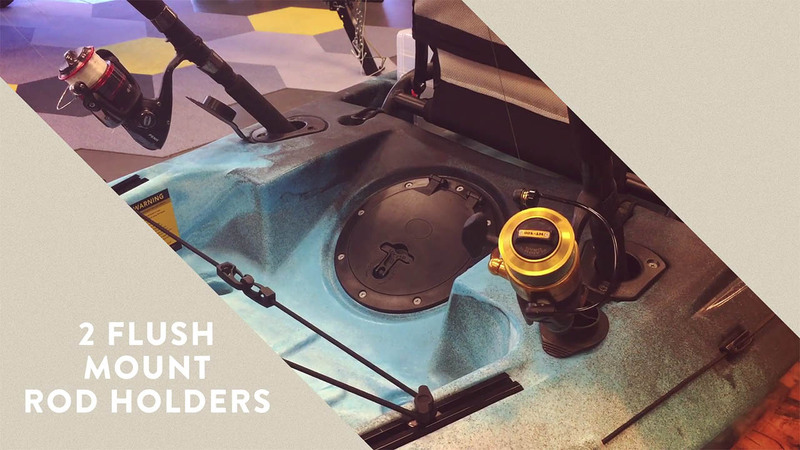 Center Console - Good Storage Capacity, But…..
Rod holders - Two for a fishing kayak, really? Vibe Sea Ghost 110 is the small brother of Sea Ghost 130, which comes at 13’. With every engineering piece, you really have to compromise some features for the others. Like, to make a kayak more portable you may have to sacrifice a lot of storage space. So, it really is about finding a nice balance between features and not to compromise the real trademark that your company stands for. Vibe Sea Ghost 110 is really a feature-rich, built to last, well-made fishing kayak. Stability of a kayak pretty is important as you don’t want a kayak that might flip itself in the water. While purchasing, for Sea Ghost 100 you really don’t have to worry about it because its stability can’t get any better. I tested it in both plain and windy waters and I was really surprised to see how stable it was in both. It sailed just fine in windy and rough waters, where other smaller kayaks could have flipped and there was no wobbling, it went like there was no roughness in water. I don’t think any kayak of this price is stable as Sea Ghost, so if you are looking for a kayak that you can take out in windy and rough waters this is the kayak for you. Talking about comprising one feature for another, center console of this kayak is big, but you know what it leaves very little space to stand. So, if you have to stand up for reeling some big redfish, you may be a little cramped for space. But, on the other hand, the center console is big enough to keep all of your needs that you need to keep at hand while fishing. Fishing is a game of patience, but your patience can only be a joy if your seat is comfortable and Vibe really considered this while making this seat. Seat, as told earlier, is its marketing feature. It is pretty great and I won’t be exaggerating if I say I can sit on it for days. The seat other than being comfortable is also adjustable to two different heights, so you can customize it according to your comfort level. 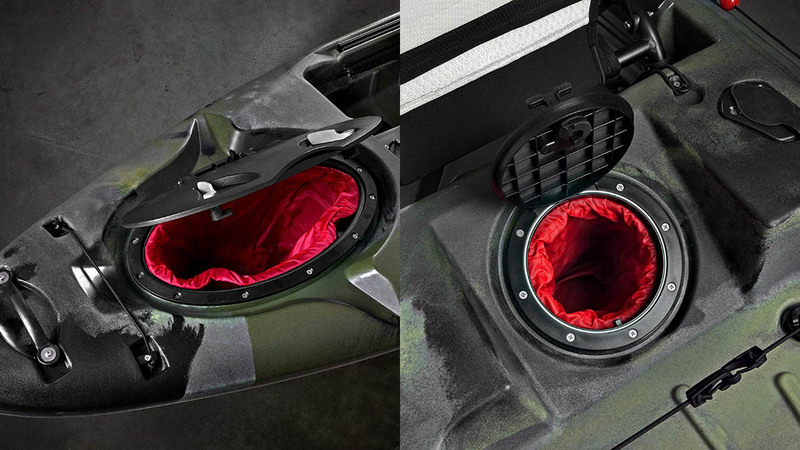 Other than a center console, it has three other dry storage compartments where you can keep your stuff without worrying that they might get wet. Problem with multiple storage compartments is that they have unbalanced the weight distribution of kayak which is not good for maneuvering. With center console already large, it could have been a little better thought out in terms of storage compartments so it does not compromise the balance of the kayak. 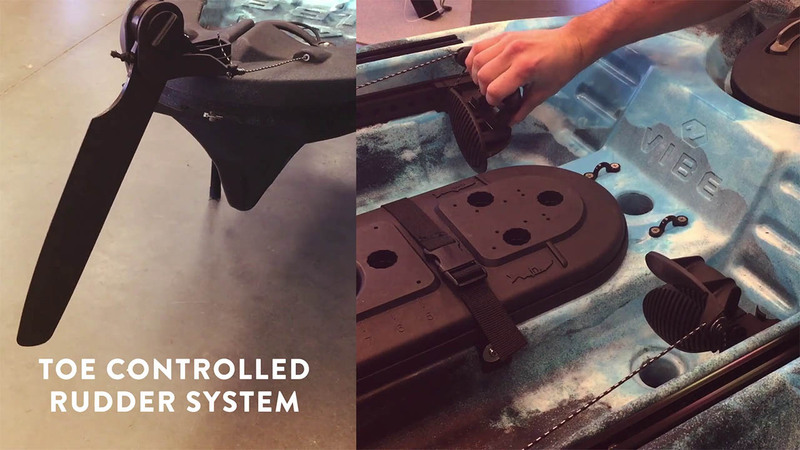 Sea Ghost 110 rudder system comes with pre-installed rudder with a toe control system which can be attached and removed easily. Rudder system is really the thing you need when kayaking through heavy windy waters. It makes kayak to turn easily and put it back on straight track. For some people, it is helpful but those who just kayak on plain water it may come as a problem because it comes in the way of footrests, however even then it is not a big problem because it is removable. For a fishing kayak, rod holders are things of sheer importance. Luckily, Vibe has installed two flush-mounted rod holders in Seas Ghost 110 which are in the stern. Additionally, the rod holders are capped, so when the rods are in use they don’t get flooded. Rods act like two spare arms and can cut the mount so deep within the kayak that rods stay safe and secure. 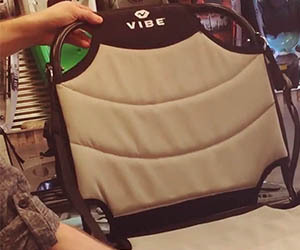 There are other kayaks which have fancy rod holders that look good but doesn’t serve the purpose but Vibe has kept this simple and efficient. One disappointment in terms of rod holders was that the Sea Ghost has only two flush mounted rod holders, it could have been better in terms of numbers which increases the probability of a catch. Vibe’s Skipjack 90 comes with four-rod holders, so if the number of rods is a concern for you, you can go with Skipjack 90. The speed of Ghost 110 is pretty great when the water is rough and windy, but when the water is plain because of its weight with its size does not provide the best of speeds. However, it was made to drive through windy and rough water and it works well there. This is a good option for people who are interested in that kind of stuff. Rudders and installed in Sea Ghost 110 to provide efficient maneuvering in conditions which are not ideal. At 11 foot, you are naturally going to get better maneuverability than any big kayak. Because of the compartments, there is a hollow space left in the kayak and when the compartments are empty it causes an uneven distribution of weight in the kayak which contributes to wobbling when rudders are removed from the kayak. So, overall maneuvering with rudder and some weight in compartments is good, but if this is not the case the situation is reversed. Tank wall is of pretty decent size and crates of standard sizes can be fitted easily. Along with that, there is a built-in bungee system which can keep your luggage safe and in place. The tank wall is big enough to fit with a backpack as well. Material of construction of Vibe Ghost 110 is rotomolded one-piece high-density polythene. Because of its material, it comes at an affordable price. If aluminum or other metals were used in its construction, it would have cost too high, but despite this price and material, this kayak has good durability to last you for years. At 11 feet, this is big kayak which makes its transportation a little bit difficult. It is hard to fit it in the back of SUV or on the roof of small trucks because of its weight, so for transport of this kayak, you might need a specific trolley designed to transport kayaks. This kayak weighs about 62 pounds which is a bit heavier than the other kayaks of similar sizes, but because of the handles, it is not very difficult to carry. A single person might not be able to carry this on his own because of its length, but even a kid can help you with it. The weight of kayak sometimes limits its speed which is not very good for a kayak of this size. Like the most kayaks, it comes with standard accessories and kayak paddle is the most important of them. Sea Ghost 110 comes with Vibe Evolve paddle which is pretty good. The paddle has blades which can help in windy and tough conditions. Moreover, it comes with scupper plugs, so you don’t have to buy them separately like most other kayaks. Sea Ghost 110 doesn’t have any complex feature which a beginner may find hard to understand. It works well for both beginners and pros, but it is recommended to beginners not to take this kayak in the windy situation as it takes a little getting used to. You can attach any standard fishfinder and transducer through its various mounting points. When I was purchasing this kayak, I was running really low on budget and this was the best I could get. At the time of purchase, I didn’t expect so much from it because of its low price, but after using it for several months my perspective about it has completely changed. I don’t think there is any other kayak which can match this beast and come at the same price. For what it is worth, it is good stuff and is worth spending money on. How does the Vibe Sea Ghost 110 kayak perform in class III rapids? How many holders does Sea Ghost 110 have? Sea Ghost 110 comes with two rod holders. Which fish finder will fit a Vibe Sea Ghost 110? Any standard fishfinder can be mounted to its different mounting points. Is Sea Ghost 110 good for speed? The speed of Ghost 110 is better than its competitors that come at the same price but it could have been better if the weight of kayak was reduced. Is Sea Ghost 110 stable enough to go in tough and windy conditions? Yes, Sea Ghost 110 was specifically designed for windy and tough conditions and it works pretty well in those situations. If you are looking for a feature-rich budget-friendly fishing kayak, you don’t need to go any further than this beast of a kayak. With its huge capacity and ability to sustain in various tricky conditions, it really is a class apart from similar kayaks. Its huge storage space provides enough space for all of your fishing or camping gear. With its comfortable and adjustable seat and stability, you can spend hours on it without having to put your back to any stress. While limited mounted rod holders and limited standing space can put any angler off, its multiple mounting points really provide an ability to any of your fishing accessories without having to dig up a hole. All in all, this is a well thought out and well-made fishing kayak made for both beginners and experienced kayakers. Its built-in rudder adds to its already better-than-average tracking for a kayak of this size. So, if you are looking for a relatively small, feature-rich and speedy kayak which is stable in windy conditions and choppy waters, we would recommend Sea Ghost 110 hands down.